JIO Summer Surprise Offer is not ENDED Yet. Hurry - get it NOW. 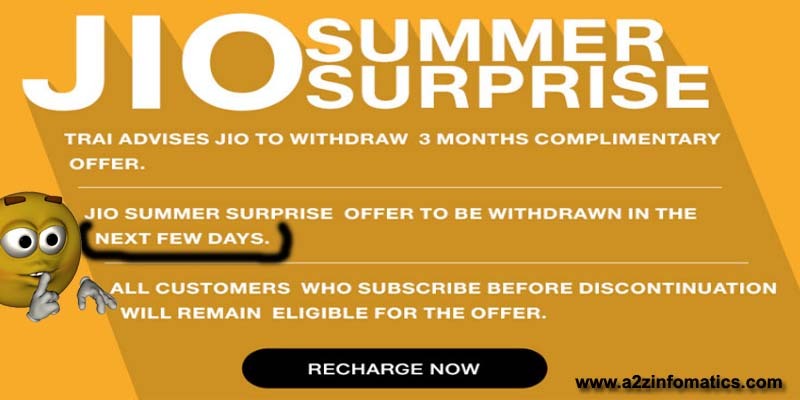 Home » Blog » Latest News » JIO Summer Surprise Offer is not ENDED Yet. Hurry – get it NOW. Hello Everybody, Today, we are here with a good news for the people who were feeling disappointed after the viral news about Jio Summer Surprise Offer ended on 6/4/2017, after the Telecom Regulatory Authority of India (TRAI) directives. Good News – JIO Summer Surprise Offer is Still Available. We just received the below message by the JIO team (on 8/4/2017 at 9:39 am) which clearly indicates that the Summer Surprise Offer is still open for the users but surely going to end Today midnight. Hurry up and enjoy 90 more days of free JIO services. Earlier there was some clear hint for the JIO users, in the statement released by the JIO Officials after TRAI advice to roll back Jio Summer Surprise Offer. Please have a close look on the released statement by JIO on 6/4/2017. Jio is in the process of fully complying with the regulator’s advice, and will be withdrawing the 3 months complimentary benefits of JIO SUMMER SURPRISE as soon as operationally feasible, over the next few days. Don’t you think the term “operationally feasible” is saying that JIO will give enough time to their users to get enrolled into the JIO’s Summer Surprise Offer. How to get JIO Summer Surprise Offer ?. Visit any nearest JIO retailer or Reliance store and ask for the INR 303 or higher recharge for your JIO number. If you prefer cashless transactions, Use Jio’s Website (http://www.jio.com) or You can use JIO money mobile app. Important: Jio Summer Surprise Offer is only available for the Prime members. Make it sure that you have enrolled into the Prime membership. Otherwise, go for the bundled recharge package (Jio Prime + Rs 303 or higher). Note: At present JIO is giving Rs 50 Cashbacks on all the Prime + Rs 303 or above recharges on their mobile app, JIO Money. That all for now, We will surely update this page as we got any other important update about the darling offer, Jio’s Summer Surprise.